I use few processed foods but here are a few of my store cupboard basics that contain no animal products. I stopped using cow's milk in the early 80's, long before supermarkets stocked "free from" products! Buying plant milk in cans in those days was a far-cry from the wide range of dairy free products available now in every supermarket and health shop. Nowadays, if you want to cut out dairy from your diet, the choice of milk alternatives is huge. There is oat milk, rice milk, coconut milk and of course dozens of different brands of soya milk, some sweetened, some unsweetened, and all tasting different. I've heard people say they don't like the taste of soya milk yet, when I ask, they've often only tried one! Like everything we buy, it’s a matter of personal taste so do experiment until you find the right one for you. When you cut out dairy from your diet, you become an expert on ingredients! Checking the labels of products before buying becomes second nature. Even choosing a healthy alternative to butter can be a challenge as many seemingly low-fat spreads contain whey or lactose that come from milk. Over the years, I have tried many brands of margarine, some really good ones which are unfortunately no longer available. Often, just when we find one we like, it is discontinued! The one I mostly use now which is widely available in the UK is PURE Sunflower margarine. It has an appetising yellow colour, a mild and pleasant taste and is ideal for most purposes, including baking and cooking. The only problem is the cost as it keeps jumping up in price but I look out for offers and stock up. It keeps well in the freezer and also means I never run out! Another brand I like is Sainsbury's Free From Vegetable Spread which has a pleasant taste. Vitalite is now advertised as dairyfree and is a cheaper option but I find the taste too overpoweringly strong. When it comes to alternatives to cheese, there are some great ones and some not so great ones, and rather like soya milk, it comes down to personal taste. The only ones I buy regularly are Bute Island Sheese Medium Cheddar or Red Cheddar. They are nice in sandwiches with tomato or pickle and available in health food stores. Bute Island are now making cheese for the Tesco Free From Range. The Red Cheddar is particularly good for cooking as it melts easily. 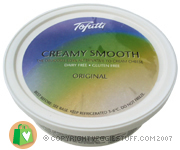 I also love Tofutti Creamy Smooth Cream Cheese which comes in Original (above) also Chopped Olive, Garlic and Herbs, Sour cream, Herb and Chive, Country Vegetable and French Onion. I can't think of anything nicer on a warm sunny afternoon than a bowl of strawberries topped with a generous serving of vanilla "icecream" or perhaps a cornet (M & S make the best dairy free cones) filled with raspberry or chocolate flavour. 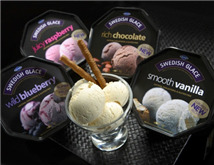 Whilst making your own non-dairy icecream is easy with an icecream maker and I am always trying out new recipes, there is an excellent product called Swedish Glace which is widely available. It comes in vanilla, chocolate, raspberry, blueberry and neopolitan flavours and is free from dairy, gluten, lactose and cholesterol. It's really delicious and has always received a positive response from friends and family. Even die hard dairy eaters and my diet unconscious friends have never complained! Yogurts make great snacks to eat anytime of the day and are also great on cereal for breakfast. ALPRO and PROVAMEL both make excellent ranges of creamy soya yogurts which you can find in supermarkets and health stores. Usually available in packs of four, they come in peach and mango, cherry, forest fruits, vanilla, strawberry, raspberry and blueberry flavours. I've tried them all and love every one! 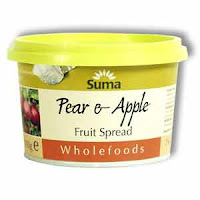 There is also a plain yogurt, in a larger 500g container, which is a great base for making your own fruit yogurts or adding to savoury dishes like goulash. If you have a hand held blender, it only takes a minute to whizz down some fruit such as a banana, add a sprinkling of sugar and a couple of tablespoons of plain yogurt to make a delicious healthy dessert. Lots more ideas here. For an instant dessert, Alpro also make longlife desserts, usually found on the "Free From" shelves, in chocolate, vanilla, caramel and dark chocolate flavours. Pateole Mushroom Spread is a lovely dairy free pate which is delicious on crispy baguettes or in sandwiches. The spread comes in a sausage shaped pack, easy to fit in your coolbag with a box of mixed salad, tortilla chips and fresh bread. And perhaps a jar of homemade chutney too! It is available in Holland and Barrett and other health stores in the refrigerated section. Of course, you can't beat making your own stock but Kallo organic vegetable stock cubes are a store cupboard essential. There are several fruit spreads around these days which, as well as being an alternative to jam and marmalade, are a useful natural sweetener in cakes such my Spiced Apple and Date Cake recipe. Made from concentrated fruit juices, they contain no added sugar.